I've never traveled for work long enough to warrant a day off in the middle of a trip, but Guatemala was different. 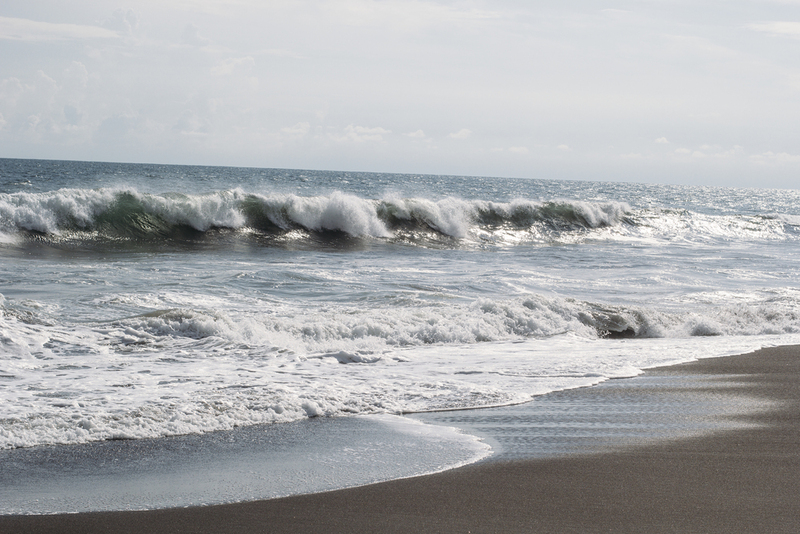 My colleagues and I decided that it would be worth it to hire a driver and go to the beach for a day, so we borrowed one of the work trucks and started off on the two hour drive from Antigua to Monterrico on the coast. A little research told us that there wasn't much in the way of nice spots to hang out on the beach in Monterrico, but one little hostel had some good reviews so we headed to Hotel el Delfin. Clearly it's gone up in the world since I was there last month because last time I googled it it didn't have a website, just a trip advisor review. We sat out in the sun all day, and swam in the ocean with some of the biggest waves and strongest undertow I've ever experienced. Just standing in a foot of surf was enough to knock you off your feet! We ate fish, tortillas and guacamole with extra lime, and had a few beers on the beach in a light breeze which was about as cooling as a blow torch. It was absolute heaven. I don't think I've ever been on a black sand beach before, but if you ever visit one do not walk on it barefoot! It really hurts when the sun starts to heat it up. Speaking of burns, I also got the worst sunburn I've had in years. That wasn't so much fun. We got lost more than once on the way to a hostel we didn't even have an address for, took a perilous boat ride, got thrown around by the ocean and tanned way too much. Ok that last part was stupid, sunburns are no joke, but it was such a wonderful day in spite of that. Just the right amount of adventure and relaxation. And we took a slightly less perilous boat ride home, where our fellow passengers were the sweetest little grandmother and her grandson who played games with each other the whole way. If you're ever traveling through Guatemala, head to Hotel el Delfin. It seemed to me like more of a hostel than a hotel, but it has a parrot that says "hola!" and it's a magical place that very much deserves a visit - if only for the black sand beaches!